You've been getting mail about alien sightings all over Misplaced Optimism. You've also been getting all sorts of job offers. Keep your eye out for a message from the Klamp with a subject entitled *Decoy Required*. 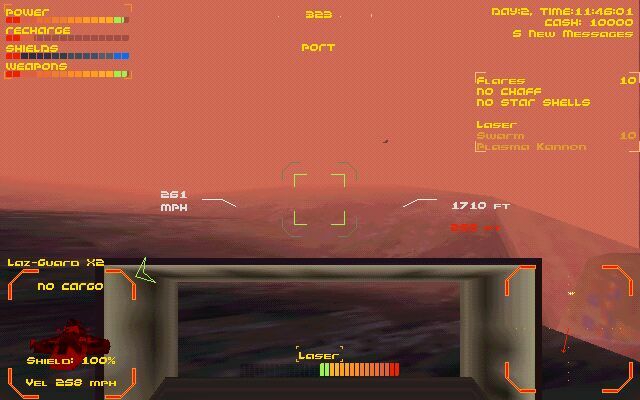 All messages that have their subject enclosed in asterisks are relative to the mission of getting off of Titan. Save them. You tend to get a lot of messages at midnight. This particular message tends to come the morning after the Alien Sighting or one day later. The message comes in the morning (usually around 8:30). The first thing you need to do is read the message. The Klamp know that the Lazarus Family have gotten hold of some alien materials and they want some of their own. They want you to help by causing a disturbance in the old Port Crater. The disturbance is caused by shooting a "Mass Driver Part" that's laying around Mass Driver 1. 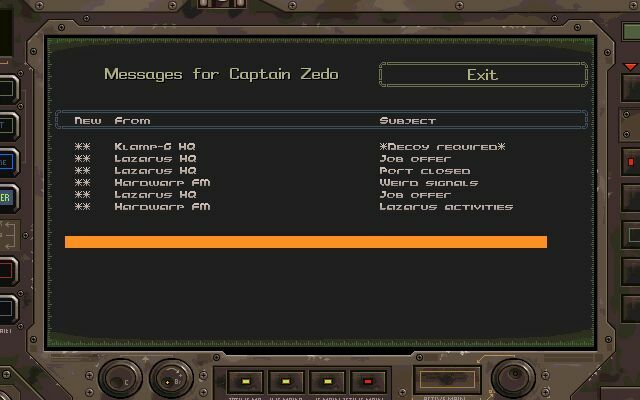 Mass Driver 1 can be targeted by clicking the "Target Subject" button in the message. Go to the Mines Crater and charge up your Cell in the Light Well there. 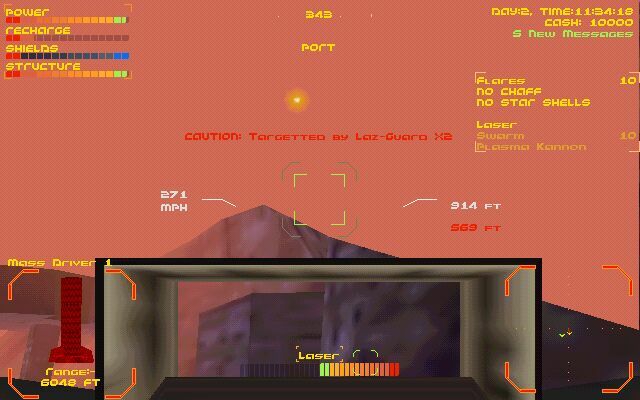 Aim for the Port Crater and make sure you have the Mass Driver targeted. Also check to make sure your Cell is fully charged and you have Laser selected as your weapon. Enter the Port Crater at full throttle. There will be two Laz Guards to greet you. Ignore them for now. Stay a full throttle and prepare to bear right and nose up when exiting the tunnel. 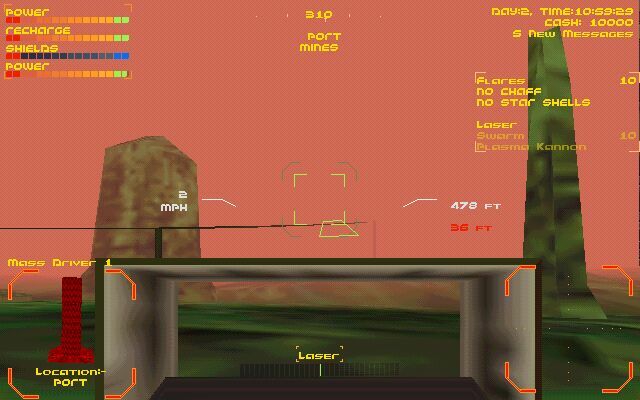 Bear right and point your nose up and head to the cliff peak just to the left of the targeted Mass Driver. Expect to take a couple of hits. Just stay on course at full throttle. Don't panic. Don't engage the Guards if you're in a Silver-Y as in the screenshots. You'll top a hill and go into a dip. Keep flying with the Mass Driver to your right. 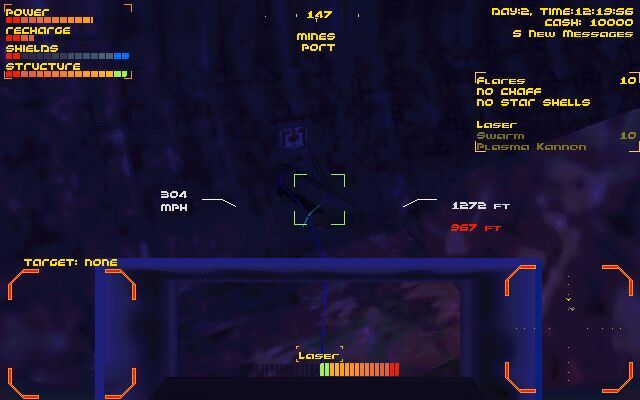 You'll see a cluster of objects ahead in your radar. Head toward them while using the "y" key to search for the Mass Driver Part. It shows up in your target view like a square box. Don't confuse it with "Unknown Origin" which is shaped like a cylinder. Shoot the Mass Driver Part. A couple of hits from a laser will do the trick. The sky will darken and a "blue storm" will occur. This is the distraction that will allow the Klamp to sneak in and get some Unknown Origin. You need to worry about getting yourself out of there. 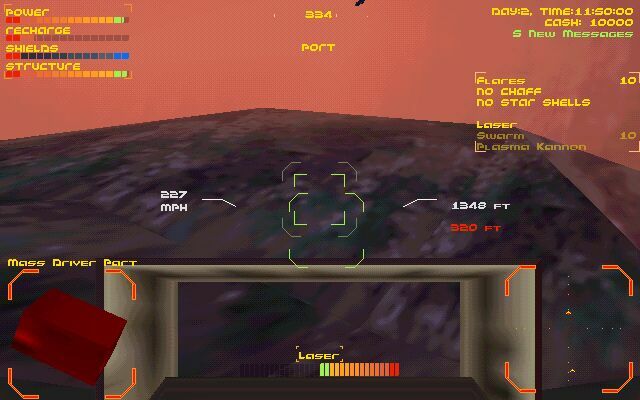 Turn your ship around until your lined up with the Mines Crater as viewed from the compass on top of your HUD. Hit the tunnel and turn right toward Midway. You want to get to a Klamp-run crater like Gamma. You'll probably need to be getting to a Light Well. Don't charge up in the Mines. You've just made an enemy of the Lazarus Family and need to be on your toes. Within a few HardWar hours the Klamp will pay you $5000 for your trouble. They won't pay you if you do anything to get on their Enemies List. Tips: If you've got enough power on your way out you can trap Laz Guard 2 and kill him for an extra $1250. 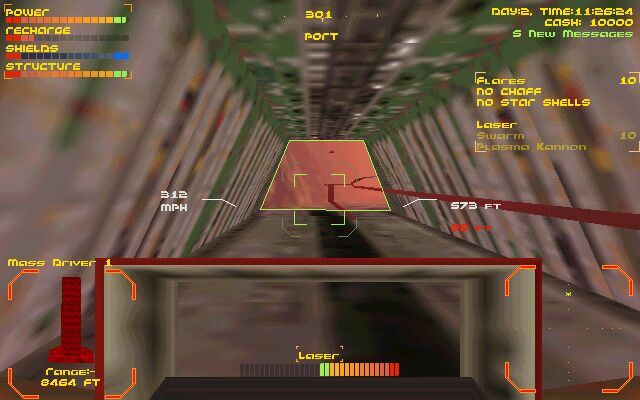 You can go all the way and kill Laz 1 in the tunnel leading to Midway. Just target them and shoot, but don't run low on power. When you're an expert pilot you can kill all three of the Laz ships guarding the Port Crater before shooting the Mass Driver Part. I've done it, but prefer killing them on the way out. At $1250 each, Laz ships are worth the effort as long as you have the skill and power. GET GREEDY. There's a lull in the plot until day ten or later, but there's plenty you ought to do. You should use this time wisely because the next three missions occur one right after the other and preparing ahead of time for each will save you a lot of time and effort. Your first priority should be getting a hangar if you don't already have one. Make money by pirating traders and occassionally killing a pirate to get your Police Record cleared. You sure don't want to be dealing with a Police Enforcer while you're still in a Silver-Y. Read the Amnesty Page and the Piracy Page for tips. Your second priority should be trading up for a better Moth and getting the new Moth outfitted. The money from the Klamp Decoy mission and the money you've made keeping your hangar open to the public will really pay off now. Remember to strip your old Silver-Y down before you trade it in. The new Moth will need at least $2500 in software and some flares. The spare laser from your Silver-Y will pay for around twenty flares. Keep an eye for upgrading your weapons to include a laser turret and upgrading to an Engine #3. After getting a better Moth and minimally outfitting it, you should turn your attention to gaining Lazarus amnesty. You are on their Enemies List for being a Klamp decoy. 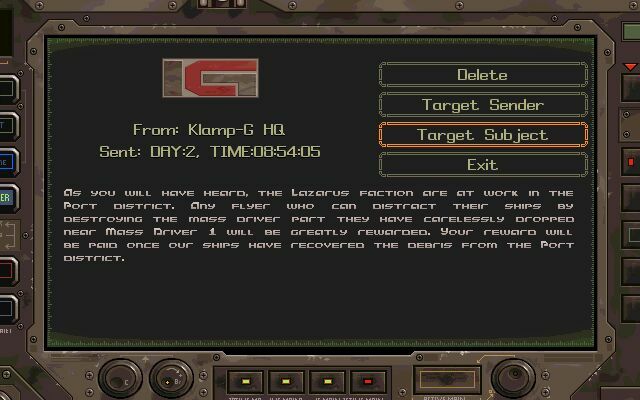 Use double amnesty by going to a Klamp facility and targeting an independent pilot who's a Klamp enemy. Lock him in. Now kill a Klamp ship. A transport is easiest to hit and may provide some booty. This will gain you Laz amnesty. 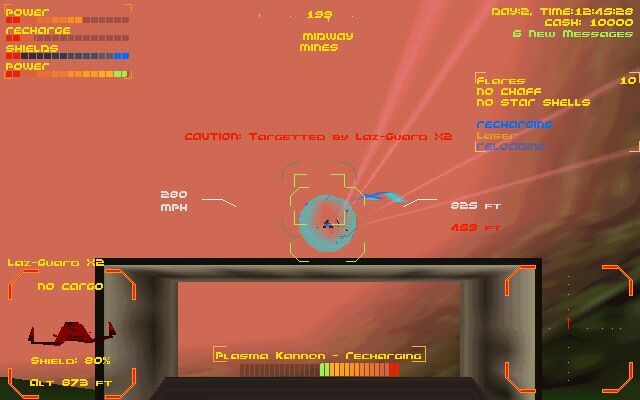 Now immediately kill the independent pilot who you targeted as a Klamp enemy. This will get you back on Klamp-G's good side. Now no one is gunning for you and you can freely travel throughout Misplaced Optimism. NOTE: When running double amnesty, you may get a persistent patrol or guard that will hound you for a while after getting total amnesty. Try to wait him out by doing business in the other faction's craters for a while. If you kill the persistent Patrol or Guard, you'll be back on someone's Enemies List. You will eventually get a message from Hardwarp FM that "nuclear ships are out". This is an important message because it signals you that gang (Skinner and Scrubber) transports are running bodyparts for alien nuclear goods: Fusion Parts, Matter, and Trigger. You need some of all three of these eventually. If you want to get ahead of yourself read Trigger and Matter. It is a BIG convenience if you can pirate some Fusion Parts from one of the gang transports or anyone else. Sell these to a component shop like Downtown Components, supply them with the other things they need, and they'll make you a Fusion Cell. No more Light Wells. Read more about trading with Downtown Components for a Fusion Cell here. If you've gotten the above accomplished and are just looking for something to do, you might want to go ahead and target the Lazarus and Klamp Secret Bases and described in the mission SECRET BASES. This will give you a leg up on searching for them when time is short.